What happens when mad scientist Dr. Simon Barsinister (Peter Dinklage) and a former police beagle Shoeshine (voiced by Jason Lee) are involved in a fiery lab accident? A dog with superpowers (soon to be dubbed "Underdog") is born, and Dr. Barsinister becomes a man obsessed with revenge and bent on genetically modifying the entire population of Capital City. An unwitting former policeman, Dan (James Belushi), and his son Jack (Alex Neuberger) adopt Shoeshine in the hope of improving their strained relationship. What follows is a typical scene of home destruction by a young dog, multiplied exponentially by the incredible strength, speed, and newly developed language skills of one super dog. While Jack and Shoeshine struggle with the conflict between Shoeshine's desire to be a regular dog and Jack's insistence that he use his newfound powers to help people, mayhem reigns in Capital City as Barsinister and his henchman Cad (Patrick Warburton-- Emperor's New Groove) wreak havoc on the entire city and Jack's dad, schoolmate Molly (Taylor Momsen) and her dog Polly (voiced by Amy Adams--Enchanted) are all unwittingly dragged into the conflict. Underdog dedicates himself to good, quickly becoming revered as a superhero, but ultimately it will take the combined efforts and understanding of Underdog, Jack, Dan, Molly, and Polly to defeat Barsinister and save Capital City from destruction. 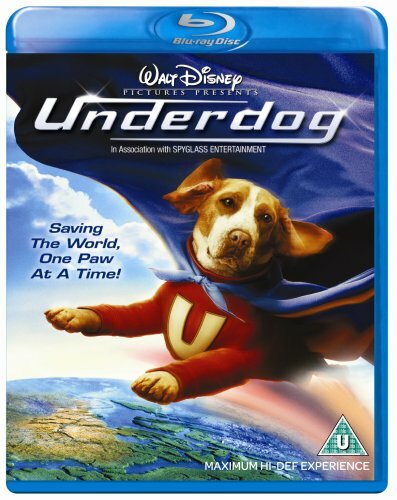 Based on the original animated Underdog television series, this live action film is entertaining, if not great.